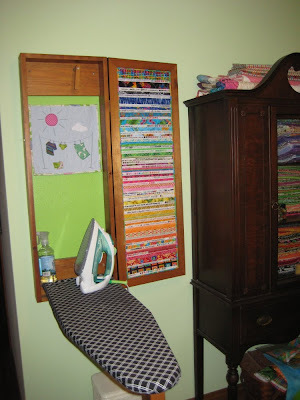 In my last post, I showed what the ironing board cabinet looked like with a pink floral fabric in the door. Here's what it looks like today. Inside- please notice my winning wall hanging compliments of Lynz. I think it's just perfect in there and I'll see it ALL the time. Thanks again, Lynz, I really love it! That bit of lime green inside the cabinet is a permanent reminder to me of why you shouldn't paint a room that gets little natural light, lime green, no matter HOW much you love lime green. 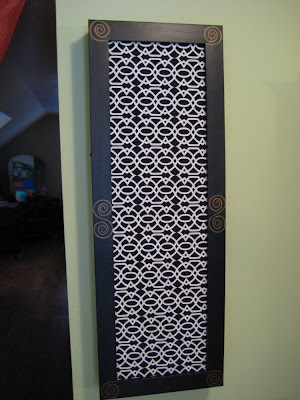 :) I painted it again, 2 shades lighter, the minute my husband left town for a few days. I'm not sure that he has ever noticed the change! lol I couldn't stand that much lime green, though, it was photographing nicely but in person was such an overwhelming color and it had a gloss to it that made it even worse. This is much better! This cabinet is right next to the hutch that holds all the fabric, so I dug out my selvages that I'd been saving and lined them up on a piece of Warm and Natural and sewed the down. I also marked several lines on it to help me from running off level as I sewed. Once they were all on, I trimmed it and then added a backing fabric and used the pattern on that to quilt them together. I basted around the edge after trimming it again to size and then I hot glued it into the frame. I didn't have any pretty cord that was big enough to cover the raw edges so I covered some cord with a bias piece of fabric that went with the colorful selvages. Close up of the cord- it looks like spline, but it only covers the raw edges. And the exterior- fabric by Paula Prass. Her daddy sees her like this and says "she's retracted her landing gear." lol Spoken just like the pilot that he was. 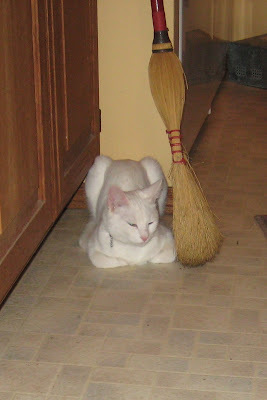 And honestly, I DO mop, but the floor sure looks dingy in this photo! It must be the artificial light! Yeah, that's gotta be it. Wowzers, that cabinet is just great. I loved the piping to finish it off, very professional, reminds of very snooty fabric covered walls that would always have piping... Very nice & creative. Oh wow, look at those selvages! I don't keep mine - oops. I think I might start. Blame the cat for your manky floor - she's obviously not wiping her paws before she comes in! Show off... hehe love it! 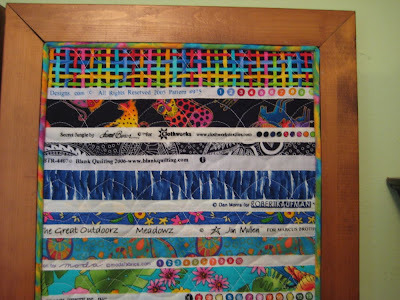 What a lovely way to remember all your gorgous prints! Hi! I was playing around on my blog (www.coffeebeansdailies.blogspot.com) and wanted to try a new template when I saw at the top of mine 'next blog'. I came across a lady whom referred to your site which I have been to before regarding the sewing caddy! My question to you is WHERE DID YOU GET THE IRONING BOARD CABINET!!?? I love it and what a great space saver!! I live in the Middle East so would need to order in online?? Love your site!! Heh. I've just painted three patches of lime green in our bedroom. I love lime in a bedroom, especially when it gets some sun, but I can't find the right lime green. Wall paints are all too dull at the moment - not clean bright colours at all. 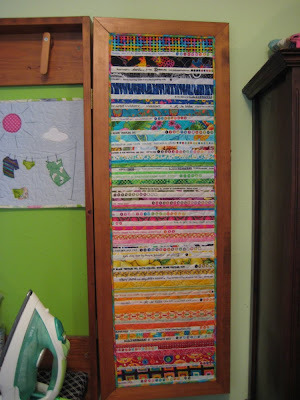 I love the ironing board cover and your sewing room is very nice. It looks like a wonderful place to be creative.